Happy Thanksgiving from all the Cocktailians to you. I don't have a particular Thanksgiving cocktail to share with you, but I will probably be making Tippecanoe Sparklers tonight after the day job releases me. 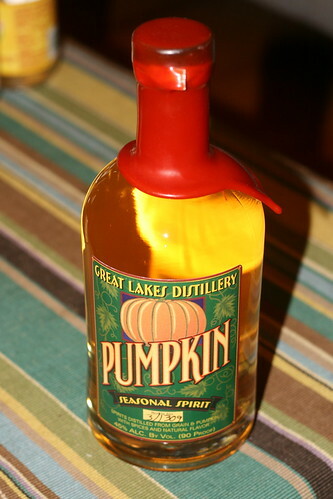 And, recently I was the lucky recipient of a gift of Pumpkin Spirit from the Great Lakes Distillery in Milwaukee. (Well, the gift was from my friend Anne -- thanks! -- and the spirit was from the distillery.) The stuff isn't quite what I'd expected, as the pumpkin nose is immediately apparent on opening the bottle, but the flavor isn't as readily noticeable, and exists more as a light aftertaste. The spirit isn't sweet at all, and it tastes like a whisky, with its attendant burn. But it's a burn redolent of pumpkins and spice. I can attest that it makes an excellent Old-Fashioned, particularly with Fee's Whisky Barrel-Aged Aromatic Bitters. Do you get your turkey drunk before slaughtering it? Or do you infuse it with various horrible-sounding flavored vodkas before you cook it?